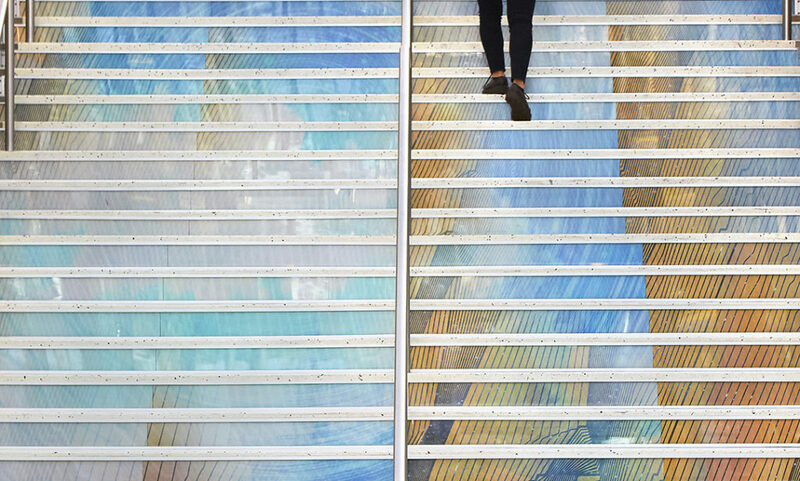 Some of our favorite public arts projects have used lenticular printing, which allows contrasting images to appear to change and move as they are viewed from various angles. The luminosity of the surface lenses give a vibrancy to the colors and the technology is low maintenance- no infrastructure or power is necessary. In particular, we’ve used this technology to create an engaging traveler experience in transportation hubs to highlight the importance of these civic spaces as people travel regionally and globally. Our work welcomes people as they arrive and gives them a sense of the local destination: its flora and fauna and the contrasting scales of experience. These arts projects provide important research for our team in terms of new technologies; using old technologies in new ways, new materials, and new construction techniques. We are able to focus on a specific process or material and develop ideas within these contained projects, integrating color and dynamism into unexpected places within the public realm. SKYSPACE is an interactive art installation in the interior of the Anaheim Regional Transportation Intermodal Center (ARTIC) in California. The project creates a dynamic holographic-type experience encased in glass within the main staircase. The design team overlaid day and night sky images with data driven movement maps of the train schedule, representing the passage of time and the movement of people throughout the state of California. When pedestrians ascend or descend the staircase, atmospheric images transform with different conditions of time and phenomena. The resulting integrated sculpture transforms this architectural feature into a symbol of transformation and movement in this transportation hub. 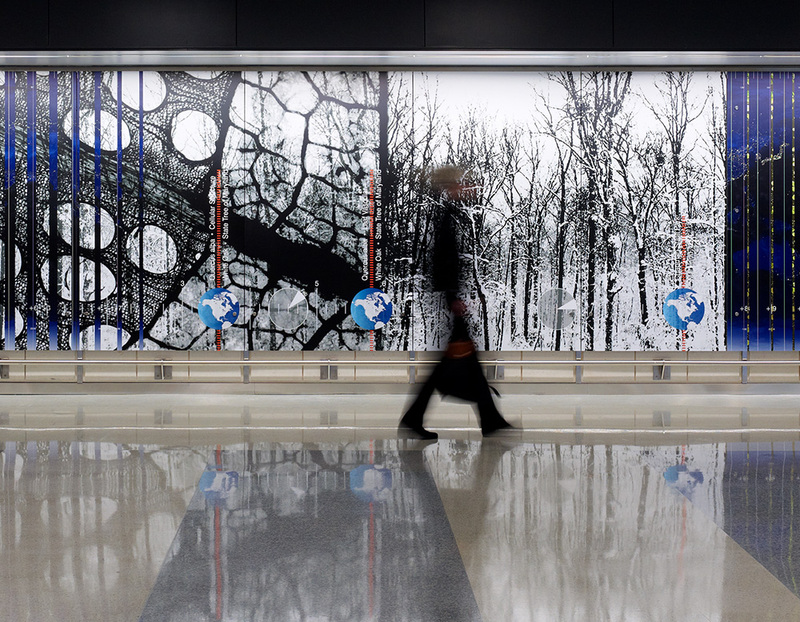 The Time Lines at the Austin Bergstrom International Airport offers travelers a sense of arrival to a locale by highlighting the fluid nature of time during travel. Translucent polycarbonate panels feature views of vibrant, digital lenticulars that dynamically transform, representing time over a 24-hour period. The imagery shows the UTC defined time zones (coordinated universal time), creating a delicate web of lines that represent global time. One layer shows incremental solar and lunar transformations of the sky from night to day, while another layer illustrates the world’s land masses and marks the traveler’s geographical location in Austin. Time is ambiguous within airports; travel across multiple time zones further blurs the sense of time and order. The Pendulum installation offers travelers a sense of arrival to a locale and destination while highlighting the cyclical nature of global travel. A series of folded and digital lenticular resin walls juxtaposes transformations in global and local time, while highlighting the­­ light conditions that shape our experience of place. A multilayered visual experience encourages both brisk movement along the corridor and still moments of interest, allowing for travelers to experience the piece at multiple velocities and durations of time. One view of this lenticular sculpture utilizes global satellite images, showing the transformation of light as the earth orbits the sun. The other view underscores the local seasonal transformations with the annual cycles of nature defined through images of the native hardwood forests in the region.